In the courtroom of Circuit Judge Karen Ahn, two undefeated teams from Hawaii Baptist Academy competed against each other Tuesday for the Oahu championship of the Hawaii High School Mock Trial competition. 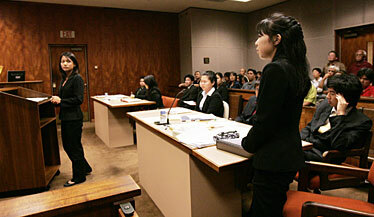 Representing the plaintiff, Merril Adachi, right, raised an objection as Jennifer Hu, left, at the podium cross-examined a witness. Caleb Alipio, a junior at Hawaii Baptist Academy, clutched his notes and looked down as he introduced himself to the judge during a mock trial practice session at Hawaii Baptist Academy. "Did you have to look at your notes to tell me you were Caleb Alipio?" nudged Robert Fricke, one of several attorneys volunteering to coach the school's mock trial team on a Saturday morning. Alipio, a football player, shrugged sheepishly. Last week his poise helped lead his Hawaii Baptist team to victory in the Oahu round of the High School Mock Trial competition. Circuit Judge Karen Ahn named him top attorney, citing his "polish" and "sophisticated technique." Students are gearing up statewide for the Hawaii High School Mock Trial championship March 8 at the Supreme Court, but the future of the program is uncertain. The nonprofit group that has run it since 1994 is stepping down after this season, citing competing priorities. Devotees of Mock Trial vow to keep it going, saying it helps transform students into confident public speakers who can analyze tough issues and think on their feet. "There are too many people involved with this that care too much for it to fall apart," said Michael Anderson, a 23-year-old math teacher at Waianae High, which fielded a mock trial team for the first time in many years and wound up beating Punahou. In mock trial, students play the roles of lawyers and witnesses, preparing both sides of a case and going to trial before real judges, who donate their time after hours to hear and critique the kids. The students and coaches give their time, too, taking on cases ranging from domestic violence to this year's topic, MySpace Internet postings. "A lot of kids have found their voices doing this," said Anderson, who did mock trial at Notre Dame and wanted to share the experience after coming to Waianae with Teach for America, which serves low-income communities. "It's an academic competition, but it really teaches you how to be an effective communicator, which is something that every person needs." Alan Kane, a senior at Waianae, did not know what mock trial was until he heard Anderson, his calculus teacher, announce a club meeting in early January. Kane has wanted to be a judge since a visit to a courthouse in fourth grade, and his team's victory over prestigious Punahou School came as a sweet surprise. "We were the underdogs; nobody really expected us to get anywhere," Kane said. "We just thought, 'Let's try to give them a run for their money.'" Anderson, who coached the team single-handedly, is seeking local attorneys to help build the club next year. Livelier and more relevant to the real world than traditional debate, mock trial draws diverse students and allows them to try on different dramatic roles, from a doctor offering expert testimony to a driver accused of road rage. Most participants do not plan to be lawyers, but they enjoy the camaraderie and competition in this team "sport" -- once they get over the jitters. "At first I was so uncomfortable with it," said Darlene Fukuji, a sophomore on Hawaii Baptist's winning team. "I had to work on the way I talked to come off with more credibility. I wasn't used to being the center of attention, especially with authority figures like the judge listening to you." Nineteen teams from 15 schools competed this year, and four will meet at the Supreme Court for the state title. Kauai High School has won often and placed second in the national competition in 2005. "It takes a lot of skill and a little luck," said Aric Fujii, an attorney and coach for Kauai High. Mock Trial is funded by a $6,000 grant from the Hawaii State Bar Association along with $200 fees from participating teams. In many other states the bar association runs the program as well. The Hawaii Friends of Civic and Law-related Education is seeking another entity to take on the program, said Elizabeth Zack, state mock trial coordinator and a board member of the Hawaii Friends. The nonprofit, run entirely by volunteers, is giving up Mock Trial to focus on its other programs, including restorative justice and "We the People," a constitutional law program. Darrel Galera, principal of Moanalua High School where mock trial is offered as part of a course, is pulling for the program to continue, saying it works as well with Advanced Placement students as with those who seem to lack motivation. Maureen King, faculty adviser for mock trial at Hawaii Baptist Academy, is equally committed. "When I took over eight years ago, I had to go out and beat the bushes to get a coach and get the kids," she said. This year the club has grown to 29 students and eight coaches, including attorneys, a prosecutor and even a judge. "People see how much fun we have doing it, and they become curious and they come and check it out," Alipio said. "I thought I was going to be an engineer, but now I want to get into law." HBA fielded two teams, which both went undefeated and battled it out for the Oahu title last week, wearing dark suits in the koa-paneled courtroom. "I'd love to have any of them defend me," said Alvin Wong, part of an overflow crowd of parents at the match. "Not that I want to be a defendant," he added quickly. "My daughter, Christie, is not planning on being a lawyer, but it's taught her to think clearly, look at all the evidence and not make prejudgments," Wong said. "She makes good arguments to get out of doing her chores."